The aim of this four-week leadership program was to give 12 Nepalese journalists and media advocates professional skills to advance the position of Nepal’s Dalit community. Particular goals were to help the group produce more effective Dalit news and current affairs media, and be more effective in advocacy work directed at getting mainstream news media in Nepal to take a more socially inclusive approach to the coverage of minorities, including Dalits and women. Nepali Dalits, or “untouchables” as they are commonly known, occupy the lowest rungs of the Hindu caste system’s rigid hierarchy and have endured centuries of discrimination, violence and social exclusion. Despite government policies against caste discrimination and the fact that Dalits are nearly one-fifth of the population, they continue to suffer reduced social, political, religious, and economic rights and many remain in dire poverty. The APJC ran the program in partnership with Kathmandu-based Jagaran Media Centre (JMC). 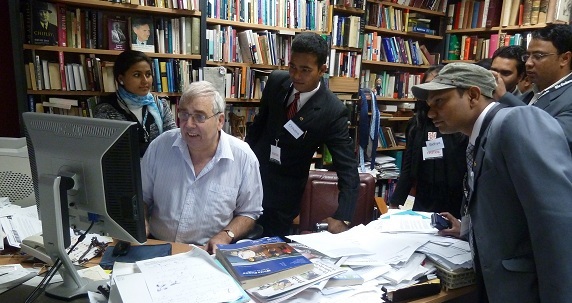 The program was supported by AusAID as part of its Australian Leadership Awards (ALA). The program began with sessions on Australian society and media, and human rights issues in the region. This was followed by a workshop on personal communication skills, professional visits in Melbourne, Canberra and Sydney to media, advocacy and government organisations, and a workshop in media skills and advocacy. Participants ended the program with a professional attachment with either a media or advocacy organisation.